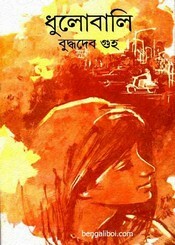 A different type novel 'Dhulobali' which is written by Buddhadeb Guha. 'Dhulobali' means dust, but this dust is not the dirt that moves around us. This dust is in our mind. The dust of our relationship, love dust, friendship dust, loneliness dust, the dust of the people who lost from the crowd in the city's life. In the era we are living in, the majority of the people are crazy in us cause of so many pollution, tension and complexity of our city life. But some people are not completely crazy but partly crazy. The manifestation of madness is different from each others. Probably there is no one else healthy. It is not possible to remain cause there are so curvaceous, pretense, hypocrisy and lying in our life. Huge dirt, rubbish, smoke, dust all around. We see a lot of distortion around us, so the wellness seems to be distortion. Read this classic novel about the complexity of our life and relations. The ebook pdf has 169 pages, 12mb file size.